The morning sun finds a pair of F-22 advanced tactical fighters in their element, prepared to counter the threat of advanced weaponry rapidly proliferating throughout the world. Built by the team of Lockheed, Boeing and Pratt and Whitney, the high Mach F-22 combines a stealthy airframe with highly efficient aerodynamic design, revolutionary F119 engines with thrust vectoring, super cruise, long range, and unmatched agility. 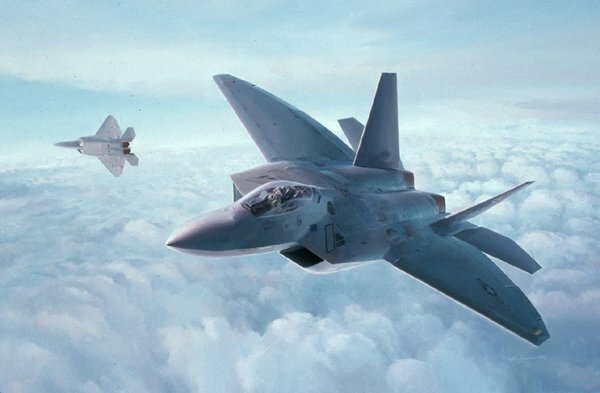 The F-22, armed with internally carried AIM-9s, AMRAAM's and 20 mm gun, low observability, advanced cockpit and avionics, is a lethal first-look, first-shot, first-kill fighter which will also out turn any foreseeable enemy aircraft and assuring that the United States Air Force has "The Edge" in any conflict well into the 21st century.